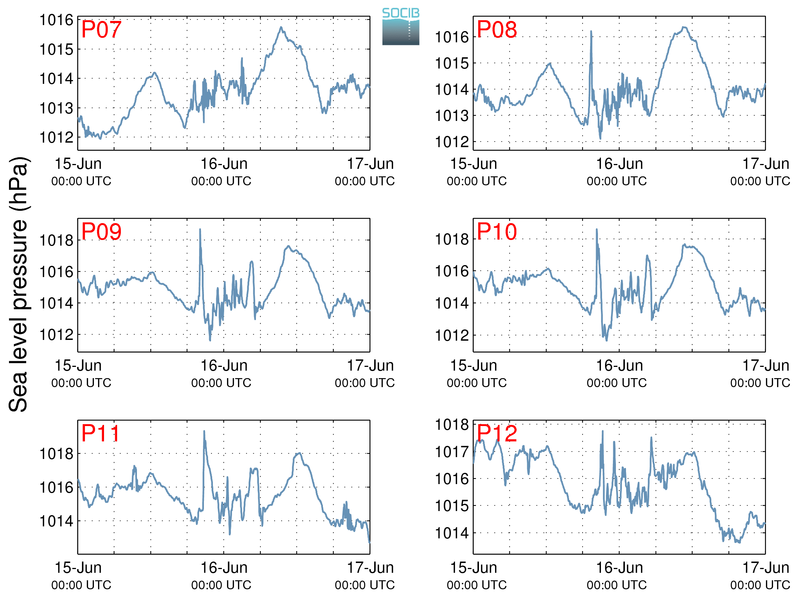 The Balearic RIssaga Forecasting System (BRIFS) aims to quantitatively predict the occurrence of extreme sea level oscillations associated with meteotsunamis in the Menorcan harbour of Ciutadella. 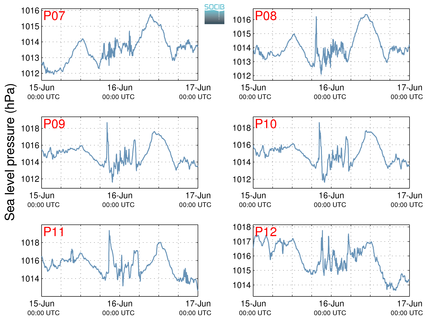 Combining both atmospheric and oceanic modelling, the system is run once a day in the morning and provides a 48-hour prediction of air pressure disturbances and associated sea level response over the Balearic shelf and in Ciutadella harbour. DISCLAIMER: The experimental products presented in this section are provided "as is" without warranty of any kind, including any implied warranties of merchantability or fitness for a particular purpose. Ongoing research is carried out to improve the system. Particular events caused by very local convection cells are known to be very challenging to reproduce. This forecasting system aims at complementing the actual AEMET Rissaga alert system by providing quantitative predictions of sea level oscillations in Ciutadella harbour. Timely delivery of daily predictions is not guaranteed. 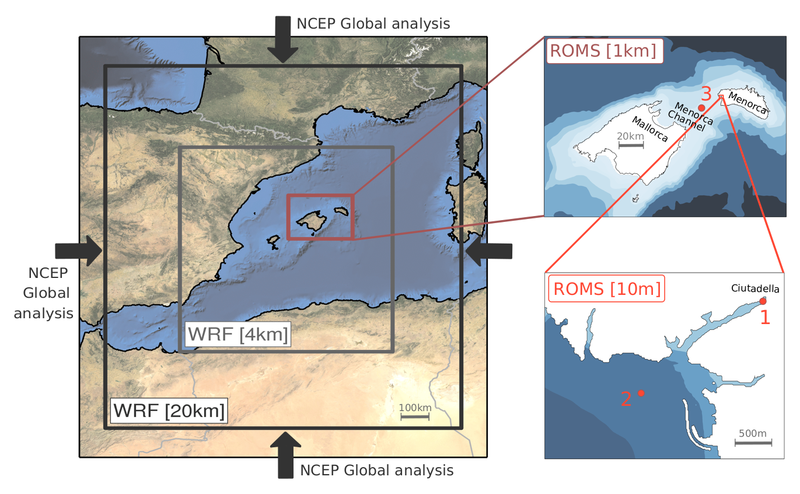 The Weather Research and Forecasting model (WRF) is implemented in a two-nested-grid configuration over the Western Mediterranean basin, with a grid refinement (4km) over an area around the Balearic Islands extending to the South until the Algerian coast. Ninety-seven vertical levels are employed with a finer resolution in the lower levels to adequately resolve the characteristic inversion layer associated with Rissaga phenomena. Initial state and boundary conditions are prescribed from the synoptic atmospheric conditions described by the FNL/GFS analysis/forecast from the National Centers for Environmental Prediction (NCEP). 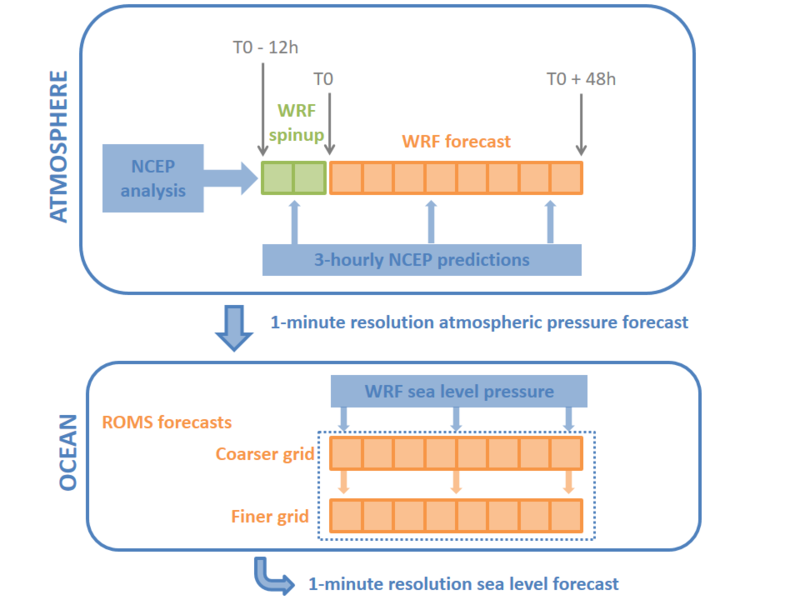 WRF air pressure outputs with a 2-minute temporal resolution are used to force a two-nested grid configuration of the Regional Ocean Modelling System (ROMS). ROMS is a 3D free-surface, split-explicit primitive equation model with Boussinesq and hydrostatic approximations. Due to the 2-dimensional nature of the processes involved in the build-up of the rissaga, BRIFS does not consider any density stratification. The larger domain covers the Balearic Islands with a horizontal resolution of 1km. It provides the boundary conditions to the inner domain, which covers the area around Ciutadella with a spatial resolution of 10m. Further details of the system configuration can be found in Renault et al. (2011). BRIFS uses a 12-hour spinup period for the WRF model before starting the prediction at 00:00 UTC every day. NCEP prediction fields are provided every 3 hours at WRF boundaries. The ROMS simulation is first run on the coarser grid using the outputs of the WRF prediction. 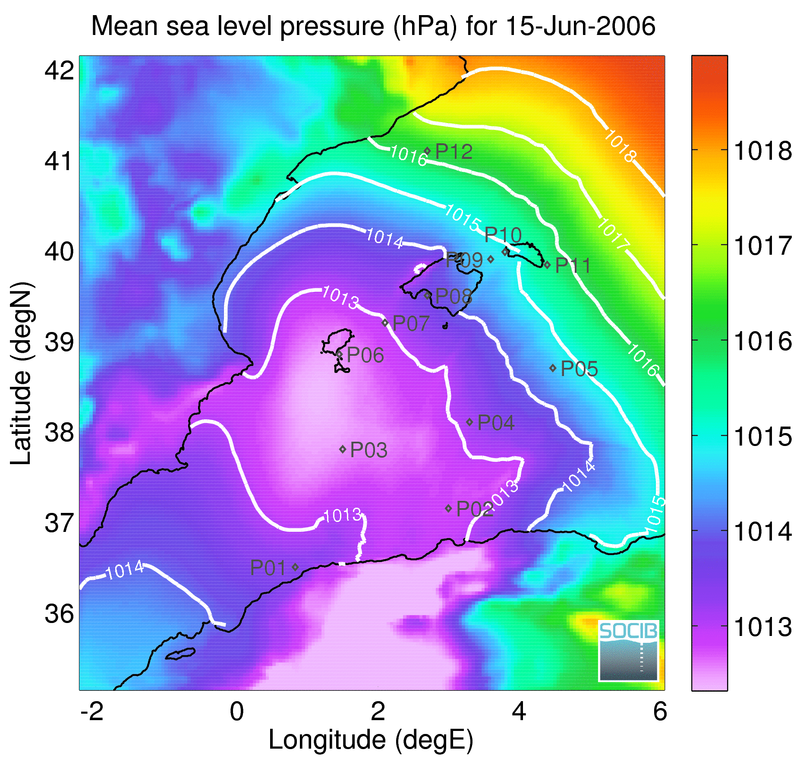 Then, ROMS forecast is produced on the finer grid using both WRF sea level pressure predictions and ROMS coarser simulation outputs at the lateral boundaries. Videos are only displayed in Google Chrome, Mozilla Firefox and Opera. 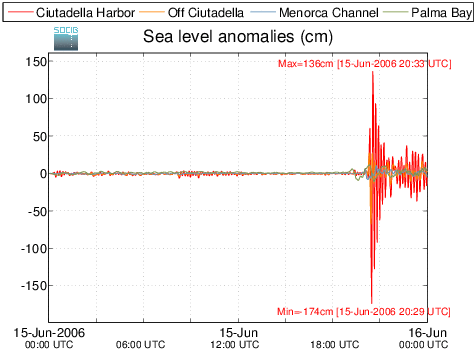 The figure below illustrates sea level anomalies predicted in Ciutadella harbour, at the entrance of Ciutadella inlet and in the middle of the Menorca Channel. 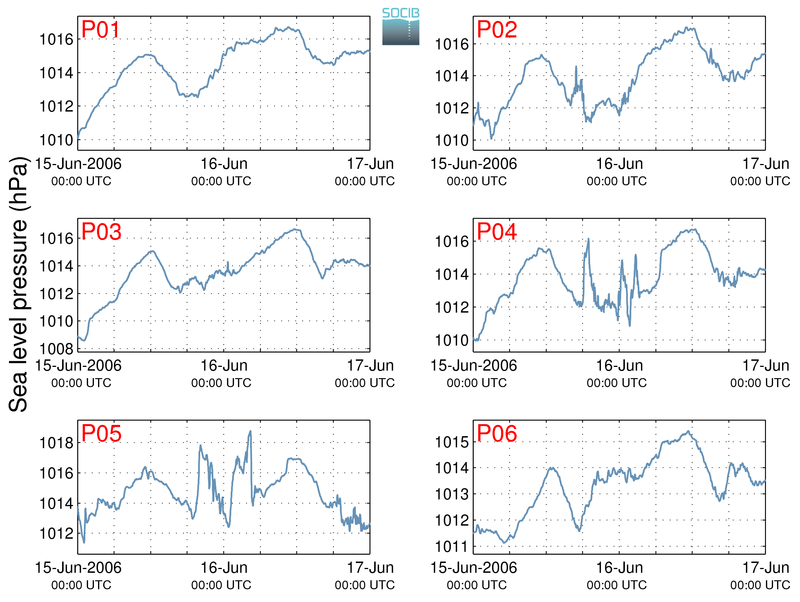 The videos below show the evolution of the WRF atmospheric sea level pressure prediction for the 0-24h and 24-48h forecast periods respectively. 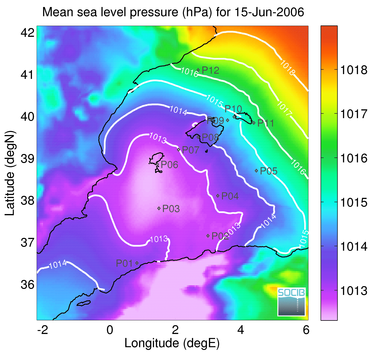 Sea level pressure timeseries are extracted at specific control points to track atmospheric pressure jumps or oscillations which are likely to generate rissagas. 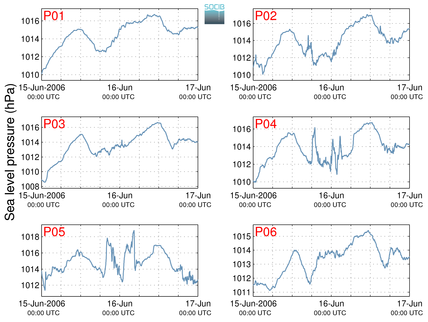 Daily averaged atmospheric sea level pressure and locations of the control points. 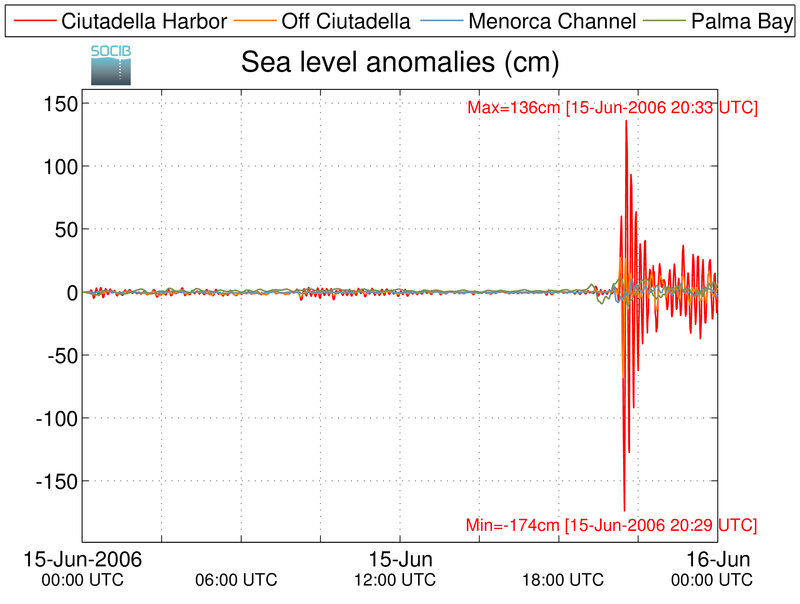 The figure below illustrates sea level anomalies predicted in the Bay of Palma, in the middle of Menorca Channel, at the entrance of Ciutadella harbor and inside the harbour.